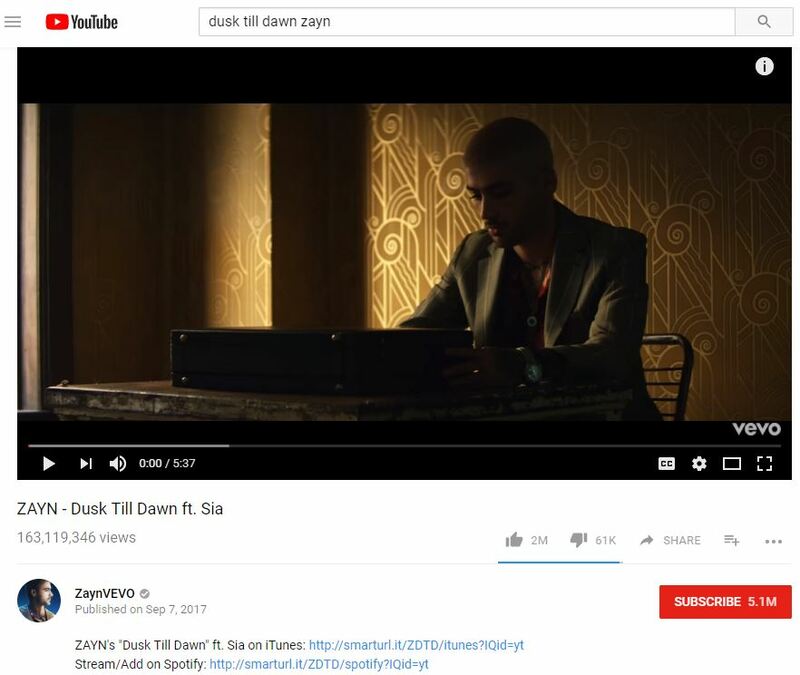 “Dusk Till Dawn” is sung by Zayn Malik and Sia. They wrote the song with the help of Grammy-winning producer Greg Kurstin. Zayn and Jemima Kirke star as the lead characters. This cinematic video also features Garrick Dixon, E. R. Ruiz, and Dana Boden. Marc Webb directed the “Dusk Till Dawn” video. Now this viral video has over 14,754,451 YouTube views and 983,000 likes. It is approaching 15M views and 1M likes. Today, the video peaked at #10 of YouTube Trending. This mini-movie starts with foreshadowing of the video’s sequential events. It also features a high-speed car chase and an unpredictable ending. Update: As of October 9, 2017, this video has 163M YouTube views and 2M likes. Click here to see the screenshot.